Cabinets Quick > Blog > Kitchens > HERE IS WHY HIGH GLOSS IS BOSS! HERE IS WHY HIGH GLOSS IS BOSS! High gloss cabinet surfaces are an impressive and contemporary look for modern kitchens or bathrooms. High gloss finishes offer a reflective surface with attractive depth of color that increases your design versatility. High gloss material is on the rise in kitchen and bathroom design as well as home remodel markets. Over the past few years high gloss acrylic and laminates have become very popular for re-facing existing cabinetry due to the visually dramatic impact on a room with minimal cost. Gloss cabinet doors can visually open up a tight kitchen area in combination with full overlay flat European style cabinet doors and sleek minimalist pulls. High gloss materials are most common in acrylic or pressure laminates, both of which are known for their resistance to heat, scratches, chemicals and humidity. Gloss cabinet materials have a very smooth surface making clean up easier and stains a thing of the past. Cabinets Quick is one of the few Orange County cabinet companies to offer Stylelite Ultra High Gloss Acrylic. We love this product so much it is used on multiple cabinets in our office and show room near the Honda Center where the Anaheim Ducks play. Our acrylic and pressure laminate doors have a core of MDF (Medium Density Fiber) to ensure a flat surface that is strong, durable, and resists moisture better than thermo-laminates like melamine. Our Stylelite panels are much lighter than full acrylic materials yet offer the same high quality gloss look with a discount on cost. 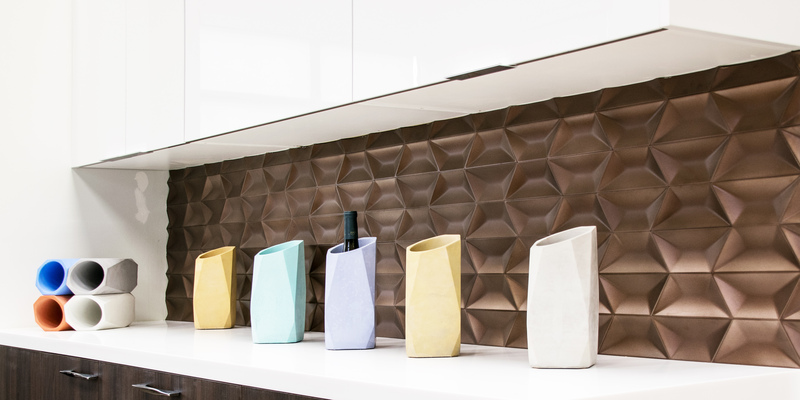 High gloss materials are available in hundreds of color options including metallic, designed patterns and woodgrains. Solid gloss color is a familiar and classic look that any commercial or residential project would benefit from. Simply find a color to complement or contrast and you have stylized the look based on one simple choice. Gloss grain cabinets offer a beautiful middle ground between contemporary and traditional. The grain highlights are brighter and more vibrant while the darker elements have a deeper color with crisp contrast between the two. We use high gloss materials in many of our projects both residential and commercial, if you wish to see examples of how we use this beautiful material please check out our gallery.